Once again I've spent some time researching more obscure Kingships. These are as far as I know the current Holders of the position of Nahnmwarki. According to what I've found the foreign Saudeleur dynasty was supposed to have been deposed in 1628 and the island divided into five traditional states, Madolenihmw, U, Kitti, Pingelap and Sokehs. Each ruler has a special title aside from Nahnmwarki. The ruler of Madolenihmw is called Isipau, the ruler of U is called Sahngoro, the ruler of Kitti is called Soukisehnleng, the ruler of Sokehs is called Nahnpwutak Pikeniap and the ruler of Pingelap is called Doahkaesa. 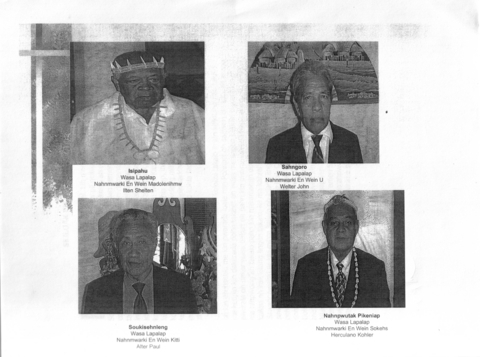 Not sure if any of the others showed therein have passed away since 2004, as the news releases which mention the traditional rulers, mostly in relation to events centering on the US Embassy, only mentions the title and no actual name. The polity of U/Uh is rather hard to research for obvious reasons. Doahkaesa Dr. Berysin Salomon meeting a candidate for the position of Senator for Pingelap. The Federated States of Micronesia, Marshall Islands and Palau all came under American rule after World War II, having been under Spanish, German and Japanese rule prior. It's remarkable how traditional institutions, social structure and land ownership can survive all that. All of them adopted US-inspired constitutions that were modified to suit local custom, including accommodating hereditary leadership and land ownership systems. IIRC, you can't buy land there but can only get a 99-year or so lease. 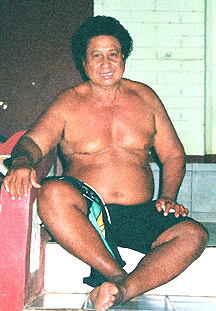 The island of Pohnpei in the Federated States of Micronesia was once a centralised state ruled by the Saudeleur. In 1628, according to local tradition, the increasingly tyrannical dynasty was overthrown by Isokelekel, who became Nahnmwarki - and the island was now split into five kingdoms. The Madolenihmw king is also the highest-ranking of those. 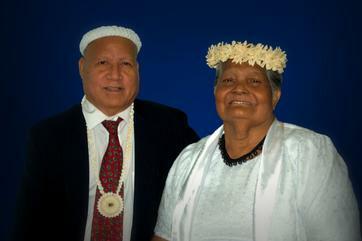 The King of the leading state on Pohnpei has bestowed an honour on Governor Torres of the Northern Mariana Islands. The Northern Marianas, centred on Saipan, is a self-governing US territory sharing its Chamorro culture with Guam. Guam has been US territory since 1898, whereas the Northern Marianas along with Palau, Micronesia and Marshall Islands passed from Spain to Germany, Japan and the US before three of those chose to become independent republics.